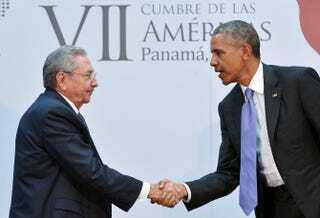 Cuban President Raúl Castro shakes hands with President Barack Obama during a meeting on the sidelines of the Summit of the Americas at the Atlapa Convention Center April 11, 2015, in Panama City. President Barack Obama will be visiting Cuba March 21 and 22, according to a Medium post by Deputy National Security Adviser Ben Rhodes. It's a historic visit, since Obama will be the first sitting U.S. president to visit the country in more than 80 years. The previous, and first, sitting president to visit the Caribbean island was Calvin Coolidge in 1928, to address the Sixth Annual International Conference of American States in Havana, ABC News notes. According to the report, the visit comes after both Obama and Cuban President Raúl Castro announced the restoration of diplomatic relations in December 2014, which coincided with a prisoner exchange and the release of U.S. contractor Alan Gross. Continued conversations since the 2014 announcement led to the reopening of embassies in both countries last summer. On Tuesday the U.S. and Cuba agreed to restore commercial air traffic, ABC notes. According to CNN, the news was met with some pushback by top Republicans. Presidential candidate and Florida Sen. Marco Rubio, who is Cuban American, said that if he were president he would not visit Cuba unless it were a "free Cuba," blasting its government as "an anti-American communist dictatorship." Sen. Ted Cruz of Texas, who is also in the 2016 race for president, slammed the move by the Obama administration as well. "I think it's a real mistake. I think the president ought to be pushing for a free Cuba," Cruz, whose father emigrated from Cuba, said at the same CNN GOP town hall meeting where Rubio made his comments. "My family has seen firsthand the evil and the oppression in Cuba. We need a president who stands up to our enemies."